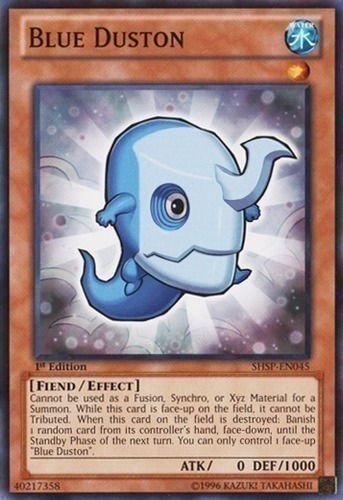 Cannot be used as a Fusion, Synchro, or Xyz Material for a Summon. While this card is face-up on the field, it cannot be Tributed. When this card on the field is destroyed: Banish 1 random card from the controller's hand, face-down, until the next turn's Standby Phase. You can only control 1 face-up "Blue Duston".